The late Sen. Daniel Patrick Moynihan famously observed that "Everyone is entitled to his own opinion, but not his own facts." It's an admonition not taken particularly seriously by today's political left. It embraces, extols and advocates ideas and policies based on what it wishes were true, regardless of how often and how consistently the ideas have been proven wrong. Take, for instance, the minimum wage. Rep. Jesse Jackson, Jr., D-Ill., wants to again raise the minimum wage -- from $7.25 to $10 -- despite an abundance of experience that doing so accomplishes exactly the opposite of what minimum wage advocates claim is their objective. Make low income earners better off. Why doesn't McDonalds increase the price of Big Macs if it wants to sell more? It's pretty obvious that consumers will buy less of a product when its price goes up. So why is it not equally obvious that consumers of labor -- employers -- will buy less of a class of labor if the price of that labor increases? The data bears out this simple logic. We have a long history showing correlation between increases in the minimum wage and corresponding increases in unemployment in those sectors that earn in this range -- the young and unskilled. University of Michigan economist Mark Perry has calculated that over the period of the last minimum wage increase, increasing it from $5.15 in 2007 to $7.25 in 2009, teen unemployment increased 5 percentage points more than the general increase in unemployment over that period. Nevertheless, Jackson feels entitled to his own facts. At his press conference announcing a bill to raise the minimum wage, he said, "Now it's time to bail out working people who work hard every day and they still only make $7.25. The only way to do that is to raise the minimum wage." 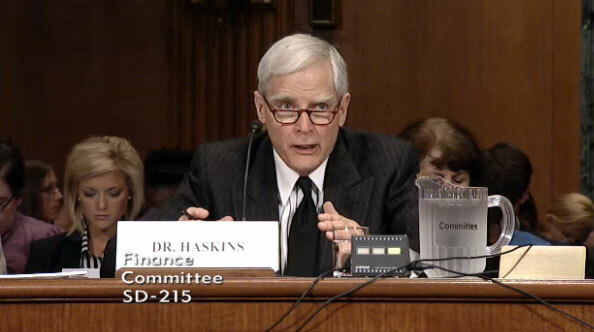 Ron Haskins, co-director of the Center on Children and Families at the Brookings Institution, recently testified before the Senate Finance Committee on hearings on poverty. Among the factors that he identified as the causes of poverty is declining participation in the work force. According to Haskins, between 1980 and 2009, work force participation among males declined from 74.2 percent to 67.6 percent. However, among young black men, work rates declined from 60.9 percent in 1980 to 46.9 percent in 2009. How exactly does Jackson think he is helping the prospects for these young black men by making it more expensive to hire them? Haskins' testimony presents an abundance of facts about our experience with poverty and with government-centered approaches to dealing with it. Experience generally characterized, for those that choose to consider facts, by more and more government spending getting less and less. According to Haskins, federal government spending, per person in poverty, has tripled, since 1980. The total being spent by all levels of government -- federal, state and local -- per person in poverty is now about $23,700 per person. Despite the dramatic expansion of government spending on poverty programs over the years, there has been little change in the overall rate of poverty. What's key in alleviating poverty? Individual initiative and personal responsibility. According to Haskins, following three rules reduces to 2 percent the chances that an individual will wind up in poverty and increases to 72 percent their chances of winding up a middle class wage earner. "Complete at least a high school education, work full time, and wait until 21 and get married before having a baby." According to Haskins' research, those violating these three rules have a 77 percent chance of winding up in poverty. What can government do so that our economy will grow more rapidly and generate more jobs? Appreciate that government cannot create jobs or wealth. Only private individuals can do that. Government should do its proper job and protect lives and property of citizens and minimize getting in their way so they may work, produce and invest.